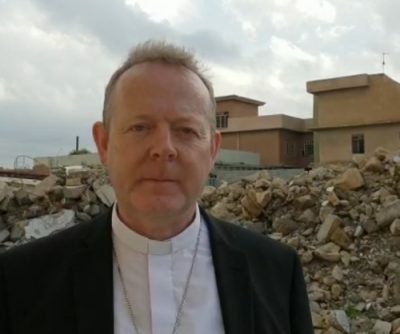 On a visit to the decimated town of Batnaya on the Nineveh Plains of northern Iraq, the Primate of all-Ireland has appealed to Irish people to support the Trócaire Christmas appeal. The town of Batnaya was attacked by ISIS 4 years ago, forcing 900 families to flee their homes. Archbishop Martin is in northern Iraq this week with the chief executive of Trócaire, Caoimhe de Barra, and Trócaire’s director of international division, Seán Farrell, to see first hand the work of the agency and urge support for the Trócaire Christmas appeal. Visiting families displaced by conflict in the region who are receiving humanitarian support from Trócaire, Archbishop Martin said it was “incredibly powerful to see the work of Trócaire in action”. He said: “Conflict in Iraq and the wider Middle East has seen millions of people lose their homes and livelihoods. They are forced to flee and take refuge where they can find it. It is humbling to spend time with these families, and heartening to learn how the generosity of people in Ireland is helping them to survive. Trócaire’s 2018 Christmas appeal focuses on the plight of those affected by conflict in Yemen, South Sudan and other countries to enable it to respond to hunger crises, displacement, conflict and human rights abuses. Meanwhile in its Christmas appeal, the charity Concern is appealing for donations for Somalia, which is currently in the grip of a major food crisis caused by drought and violence. In Somalia, Concern provides nutrition to almost 25,000 Somali children and their mothers. Trócaire’s Christmas 2018 appeal can be supported at www.trocaire.org/christmas. Concern’s Christmas appeal can be supported at www.concern.net/christmas-appeal.